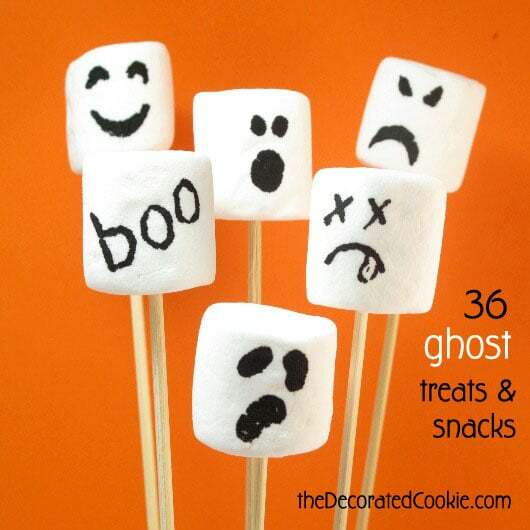 A roundup of ghost treats and snacks for Halloween. The Ghost. The classic symbol of Halloween past, present, and future. You can’t possibly celebrate the holiday without a ghost here or there. 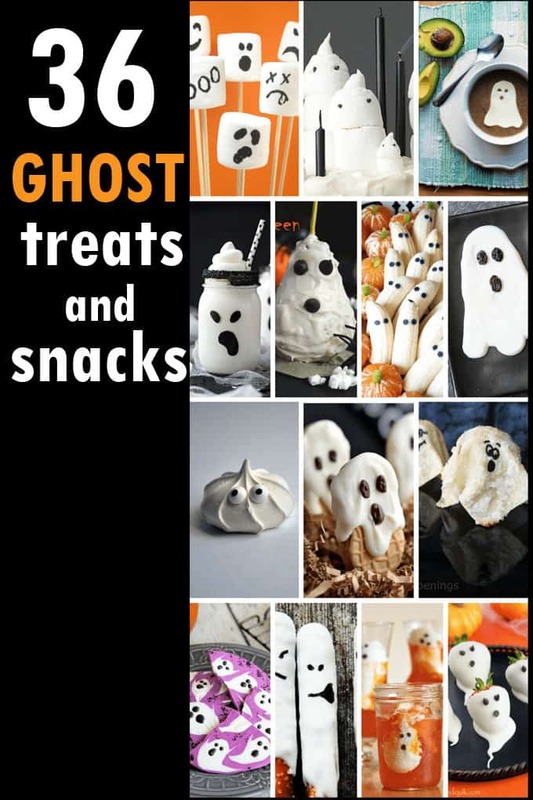 And so, I give you this roundup of ghost foods! 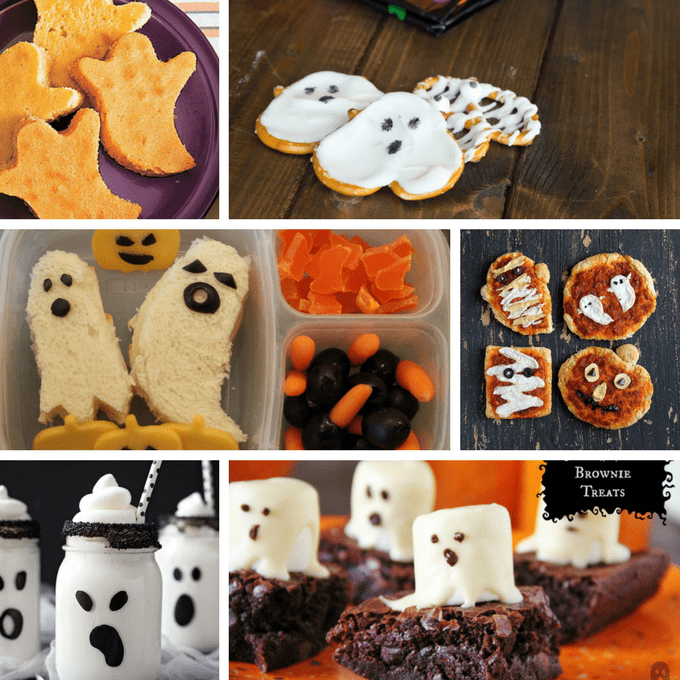 These ghosts treats and snacks are perfect for your Halloween party. I remember, oh so long ago, when we were house hunting and all of our belongings were in storage (for eight months). And I wanted to keep the blog going. But I had no kitchenware. So I pulled out marshmallows and edible writers and that was that. 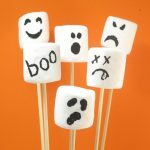 These ghost marshmallows, some of the first drawing-on-marshmallows I did, have been a hit. For all about buying and using food decorating pens, click HERE. And to see everything I’ve drawn on food over the years, click HERE. 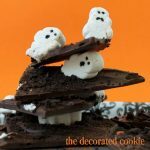 I made this ghost marshmallow chocolate bark. Pretzel rod ghosts at PBS Parents. Pears made better, and creepier, at Diethood. Or how about strawberries? At Miss Candiquik. Now it’s a party. White chocolate ghost cocktails at The Slow Roasted Italian. Lots o’ ghosts cake topper, by A Beautiful Mess. 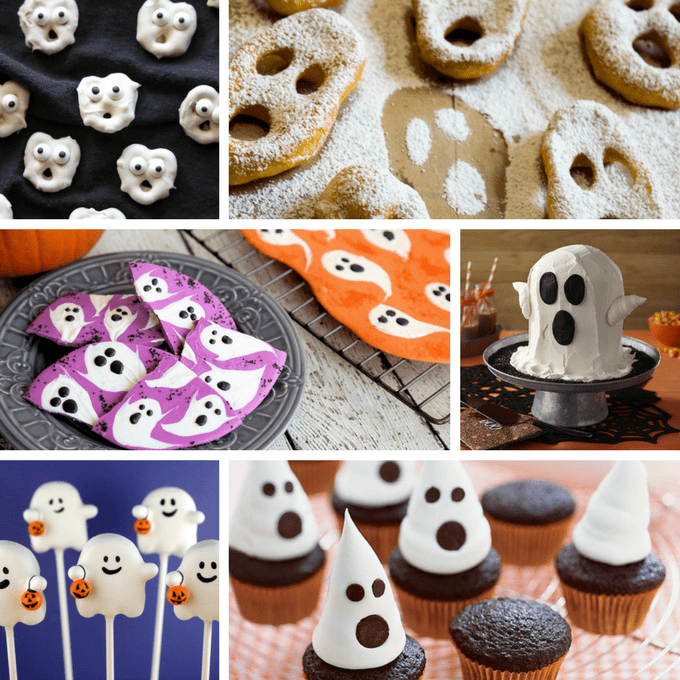 Make mini ghost pretzels at Dessert Now Dinner Later. Make ghost donuts at Heather Likes Food. Make ghost bark at Mom Foodie. Make a ghost cake at Wilton. Crazy awesome trick-or-treating ghosts at bakerella. Mini ghost cupcakes at MyRecipes, by All You. Make ghost bananas at Flo and Grace. 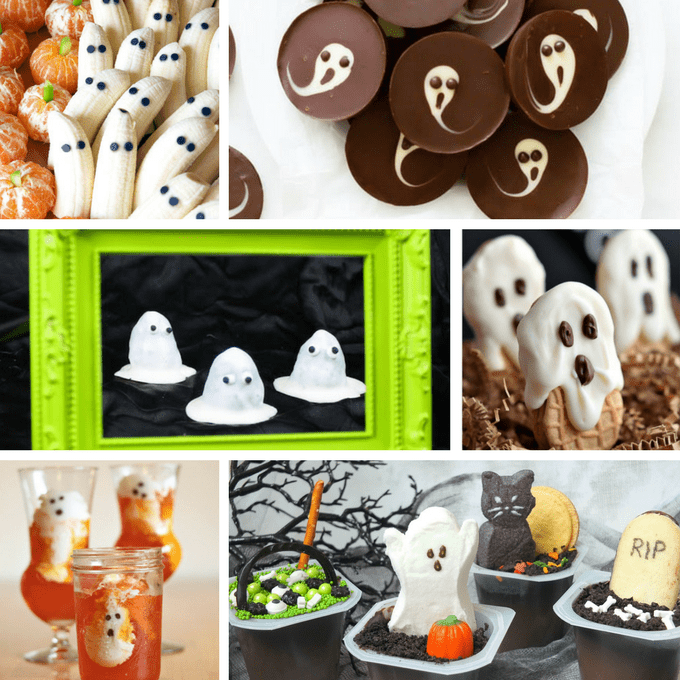 Make ghost chocolate cups at Primavera Kitchen. Ghost cake pops, minus the pops, at Bubble and Sweet. Make Nutter Butter ghosts at Homemade Interest. Ghost JellO! At Modern Parents Messy Kids. 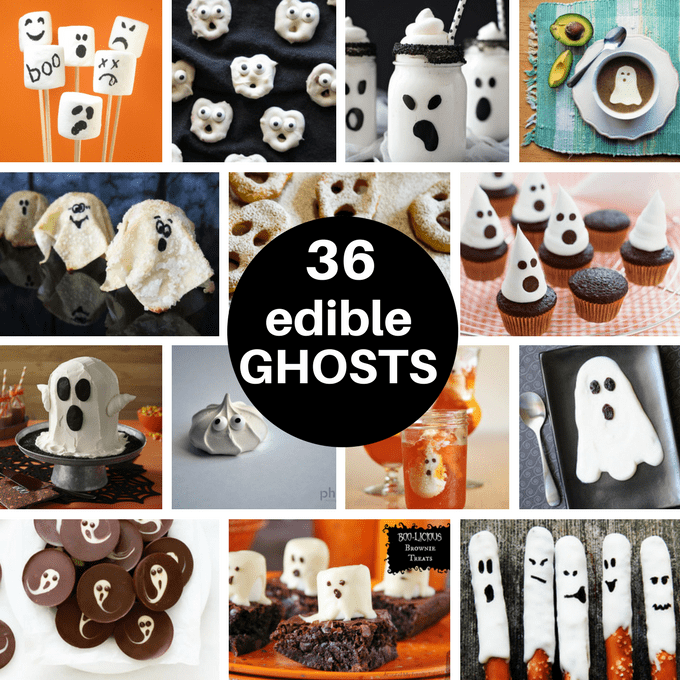 Make ghost pudding pops at Party Pinching. 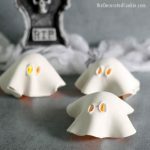 Simple marshmallow ghost cupcake topper at Martha Stewart. 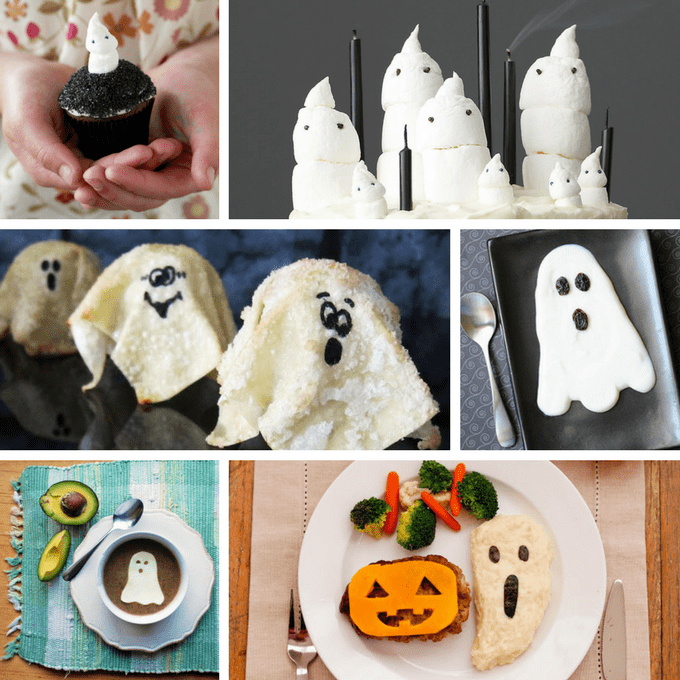 Or, a chocolate marshmallow ghost cake at Martha Stewart. Mmm. Sweet ghost crisps at Hungry Happenings. Yogurt and raisins ghosts at Canadian Family, by Meet the Dubiens. Haunted black bean soup by Cake Student. Ha, mashed potato ghost, at Taste of Japan. On a cold, dark night, stew with cornbread ghosts, at MyRecipes. 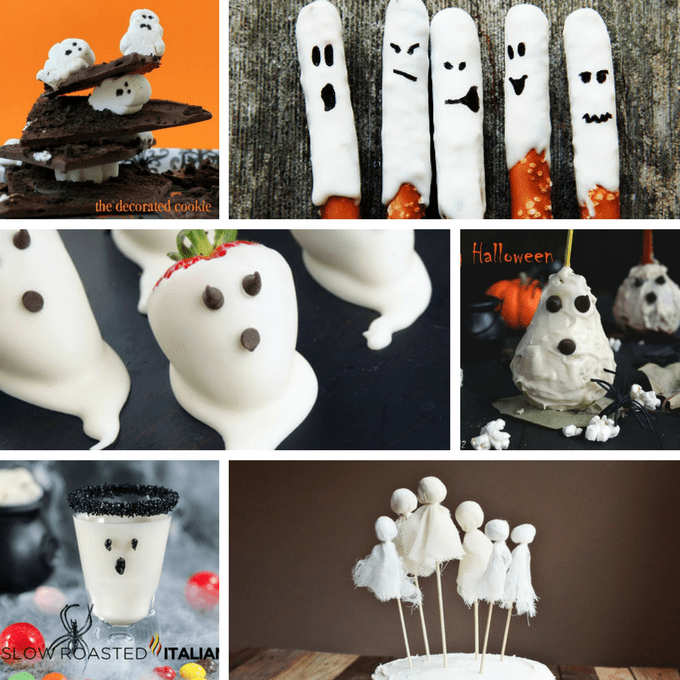 Pretzel ghosts by Dinners, Dishes and Desserts. Ooooh, ghosts in the lunchbox! At Mom Endeavors. Spooky, vegan pizzas by Vegan Richa. Make ghost milkshakes at Lil’ Luna. There’s a ghost on my brownie! At Around My Family Table. Black velvet cake pops–and Charlie Brown, too–at These Peas are Hollow. 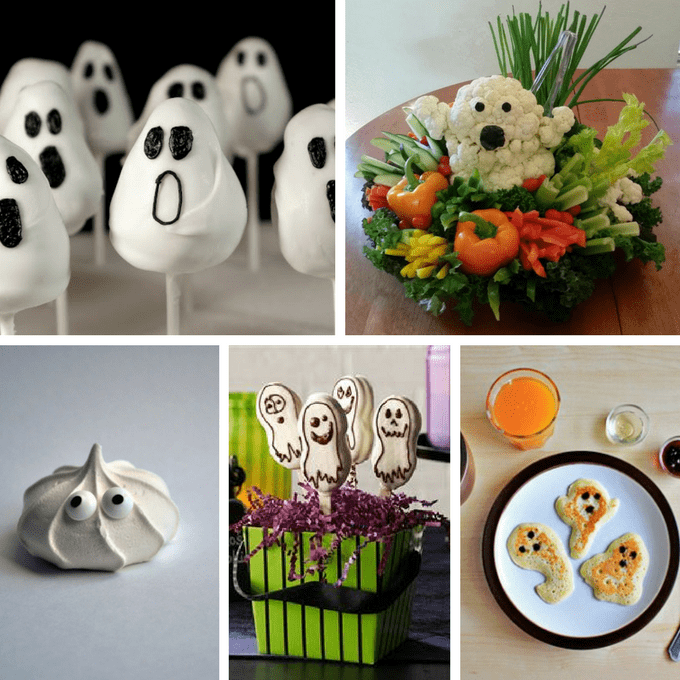 Make a ghost veggie platter at The Right On Mom. Nutter Butter ghosts at Taste of Home. Good morning, ghost pancakes, by Zoom Yummy. Thank you so much for finding these fun treats! What a great line up! I’m glad to find you. Thank you so much for finding these fun treats! Aww thank you for including my ghost among monsters Meaghan! 🙂 🙂 I have pinned this, awesome round up!